As I mentioned last week, I recently was given a gift certificate to review some teas from Adagio. A long time ago I was a regular on their sleek website with all its tea information and community resources, but since then I’ve been more drawn to smaller specialty shops. To really see what they could offer, I decided to jump straight for the “Master’s Collection” teas. My second try was their “Hsinchu Oriental Beauty”. I appreciate the naming of this offering, as even among specialty tea shops, it’s rare to see Hsinchu listed so explicitly. Hsinchu is a region in north-western Taiwan where Oriental Beauty (東方美人茶, Dōng Fāng Měi Rén Chá, or sometimes simply 白毫 – Bái Háo) is grown and processed. 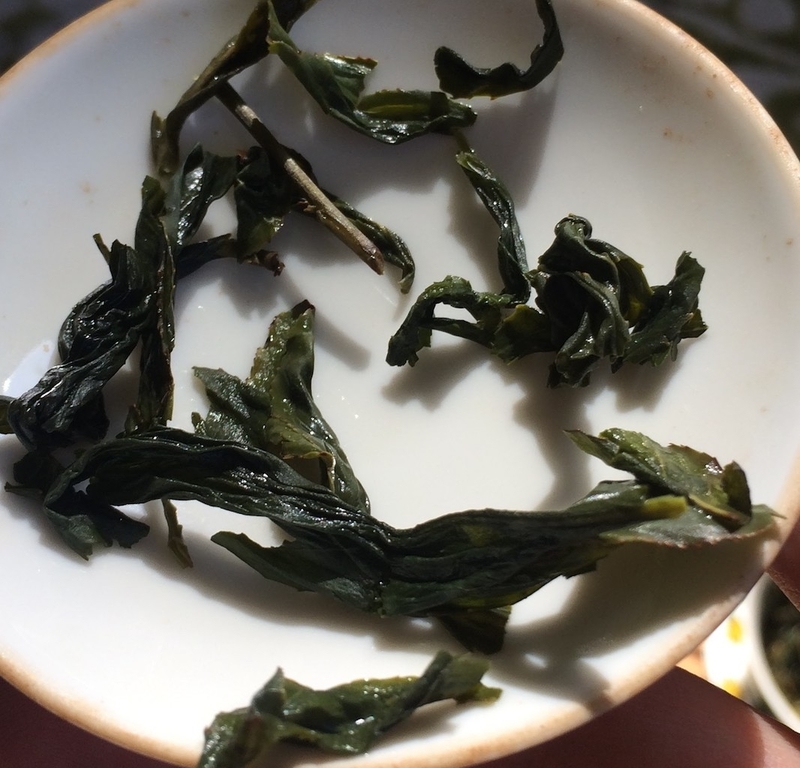 This remarkable oolong, which I’ve written about before, is gifted a very special technique around the harvest time. Before picking, the farmers encourage a species of leaf hopper insect to bite the leaves of the tea plant, triggering a chemical reaction that our taste buds find delicious. Brewed for about 2 minutes at 95°C, the aroma of this tea was striking as soon as it came out of the gaiwan. Definitely Bai Hao. That roasted grain and honey sweetness is recognizable anywhere. In fact, the perfume it gave off was almost overly sweet, reminding me somewhat of a Dan Cong. I don’t think I’ve ever had a Bai Hao quite this dramatic before, and I’ve drank a lot of it. I would recommend keeping the infusions short for this tea or at least taking care how many leaves are used to avoid being overwhelmed! That bold sweetness continued for another four infusions, so the life of the leaf is not in question. Sometimes Dong Fang Mei Ren Cha is called “honey oolong” and this sweetness is the reason. The liquor feels like a mouthful of amber honeycomb. If Bao Zhong is a Dragon of Spring Dawning, Bai Hao is a Dragon of Autumn Twilight. It’s a warming tea ready to impart a touch of kindness to a rainy day or to glow in the shadows of a sunny afternoon. Our days can be full of chaos and confusion, so please, take a moment to watch the swirl of leaves in your pot. I hope you can see within the all the hands (both human and insect in this case!) whose lives are intertwined with the tea. We’re all in this together. 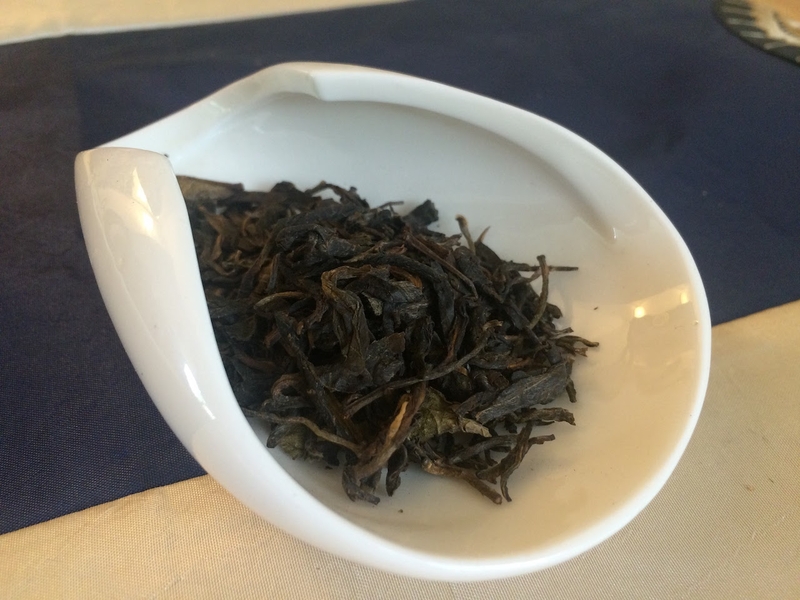 This entry was posted in Tastings and tagged baihao, oolong, taiwan on May 3, 2017 by payton. Back when I first fell in love with loose leaf tea, I quickly discovered Adagio. Compared to my other favorite of the time, Upton Tea Imports, Adagio had a sleek website, a more curated selection, and excellent packaging. Their online communities provided a space for tea discussion long before Steepster. While their selection is great, their focus on mass-appeal teas and blends eventually led me to more specialty shops and I haven’t been back for years. Unexpectedly, last week I had the opportunity to get my hands on some of their newer offerings. Specifically I went right for the “Master’s Collection” that seemed to fit my interests. Fair warning: I received a gift certificate from Adagio that paid for most of the cost of these teas. Having spent a wondrous adventure drinking tea in Pinglin, Taiwan, my first pick was what Adagio calls “Formosa Pouchong”. While exotic-sounding, this is an old way of referring to Bāo zhǒng oolong tea (包種茶). If you’ve never encountered these names, I’ll unwrap it a bit. “Formosa” is Portuguese for “beautiful” and it was a name used for the island of Taiwan from the 1500s through until the Japanese occupation in the late 1800s. A particular style of green oolong (light bodied, light roasted or un-roasted) is produced in the Wen Shan area in the north of Taiwan that is known as Bāo zhǒng or “wrapped item”. The name likely comes from some of the steps used in processing these gently twisted green leaves. Before the advent of modern Pinyin transliteration, “Bao zhong” was often rendered as “Pouchong” in the West, and here it sometimes remains. If you’d like to read more about Bao zhong or Pinglin and my time there, I have several posts on the topic ranging from my original telling of the story, to some tasting notes, to a comparison of different leaves. I brewed these dark green leaves at 90°C for 2 minutes. The dry leaf was dark and matte green. In my experience most Bao zhong is fairly bright. 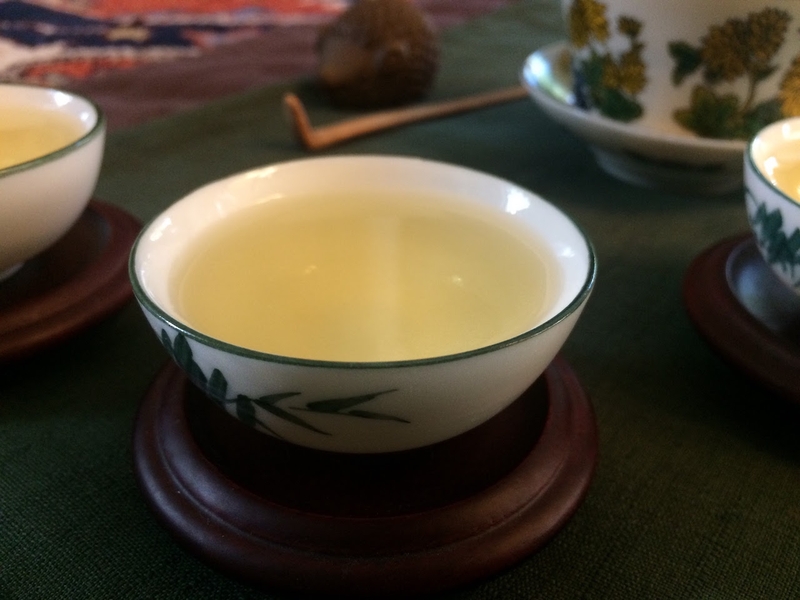 Unlike some rolled or more heavily roasted oolongs, I think Bao zhong is best consumed during the five month period after its harvest and a dull leaf can sometimes point to older tea. Once in the cup, however, a bright green liquor and delicate flavors told a different story. 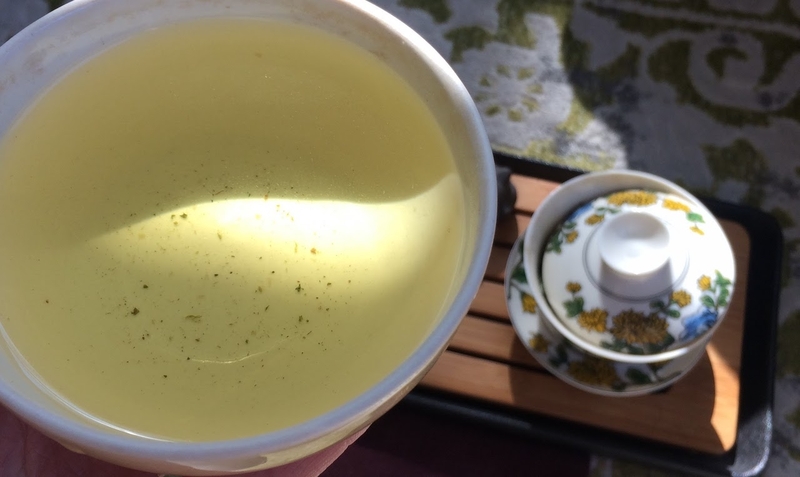 This tea brings to mind ancient moss-covered temples and glowing statues of Quan Yin. Here’s what Adagio has to say about this tea, which I’d say accurately summarizes the color of the liquor and the texture on the tongue. The liquor is a pale golden-green color with melting-butter texture, uplifting floral notes and mild, succulent flavor. The sweet floral nose lingers long after the last sip. I managed a good four infusions, increasing the time of each, before this began to loose its flavors. Longevity like that in an oolong is a good sign of quality leaf. The aroma of toasted sunflower seeds and nuts was just as I was expecting, although it was considerably less pronounced than some Bao zhong I’ve had in the past. The body is excellent and buttery in the mouth, making for a good session tea. I’d recommend this for big cups and bold brews rather than sipping delicate gongfu infusions. Wen Shan Bao zhong is always a treat for the senses, and can be a surprise for those who’ve never had such a lightly oxidized oolong before. Its flavors are almost overlapping with the character of a Liu’An Guapian or Long Jing – both quintessential Chinese green teas – and yet there’s also something more. A subtle air lives in this kind of tea that pervades the mind and brings a sense of calm, where green tea would raise the energy instead. Overall, I’m glad to see that Adagio can source some unexpected treasures and spread more good tea into the world. 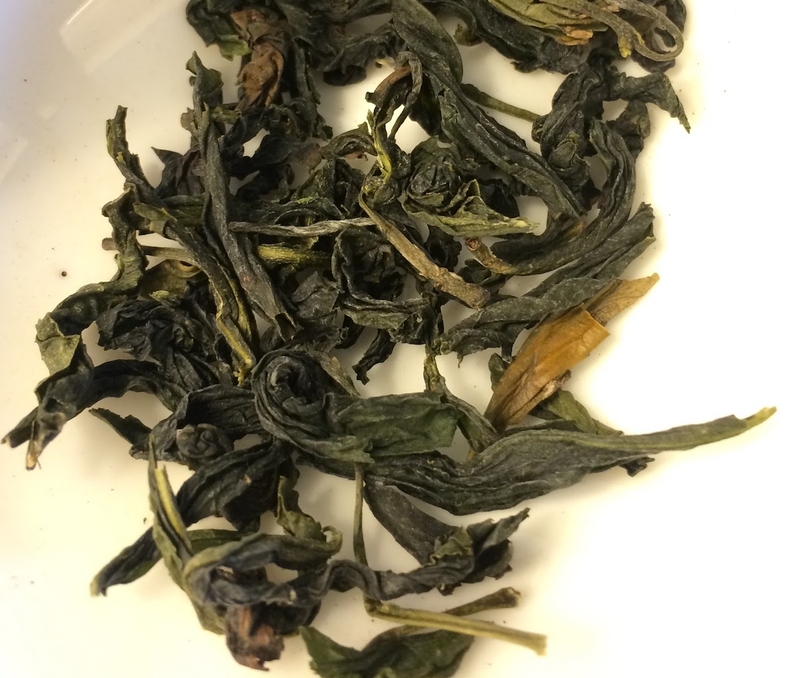 This entry was posted in Tastings and tagged baozhong, oolong, taiwan on April 25, 2017 by payton. Recently I had the pleasure to order a pile of tea from Yunnan Sourcing, a company I’ve admired for a long while but from whom I had never ordered. This chronicles my first tea from that order, a 2005 Bo Wen “Yue Chen Yue Xiang” Ripe Pu-erh. This is a 12 year-old Ripe (Shou) Puer, and as such my expectations are that it would have an earthy sweet flavor with dark liquor and ideally a pleasant mouth-feel. That said, 12 years is still barely middle-aged for a tea like this and while I don’t expect as much nuance from a Shou as I would a Raw (Sheng) Puer, this should only improve in the coming decade. I used 8 grams of leaf for my pot. The cake was very easy to break apart, which is satisfying to me. Having to chisel into a cake with a jack-hammer is never a fun experience. In the pot, the aroma of the warmed leaves was astoundingly sweet, but not at all overwhelming. It was tempered by a gentle scent of old parchment and mushrooms. Overall a good sign. For each infusion I steeped the leaves approximately 45-50 seconds. That’s a little longer than I normally would infuse a Puer like this, but any less time and the broth looked much too thin. While an inky blackness isn’t always desirable, I like my Puer to have some color to it, and with the extra wait I was not disappointed. The dusky red liquor was quite malty and creamy on the tongue. The texture and flavor reminded me of nothing less than marshmallows, yet with a subtle hint of old parchment aroma following behind. After a few similar infusions, I’d characterize this tea as comfortable. Its notes are not overly dramatic, and the flavor is mostly sweet rather than old tasting, but the thickness is undeniable. It’s neither cloying nor dusty, and I think it will be a delightful sipping Puer. Sometimes when I describe buying a brick or cake (Bing) of Puer, people are surprised at the cost. This one was not expensive, and moreover, you’re getting quite a lot of tea! Just some quick math: a 350 gram Bing for $35 USD, at 8 grams of leaf per pot, is about $0.85 USD per pot. One pot makes maybe an average of 8 infusions, so that’s about $0.10 USD per cup. And this is for a 12 year-old tea! A good deal if I ever drank one. So go out there, fellow tea lover, and get yourself some old Puer (but leave some for me!). This entry was posted in Tastings on January 16, 2017 by payton. This was a gift from the incomparable Tammie from her recent trip to Taiwan. 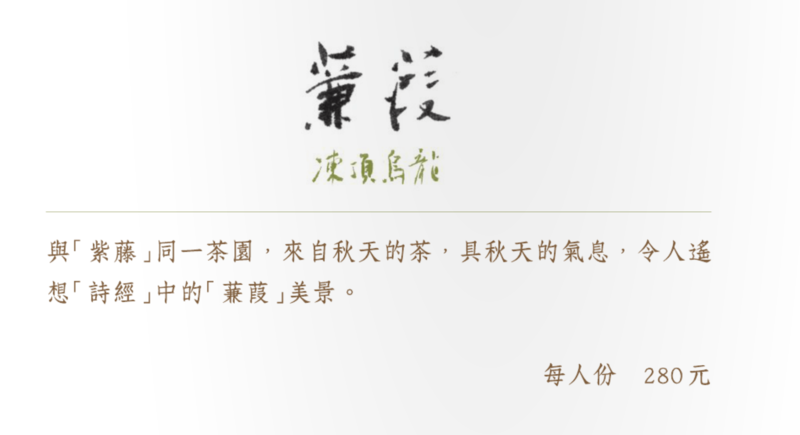 In Taipei there’s a well-known teahouse called Wistaria (紫藤廬) which I have been privileged to spend time in. Their tea is superb and they know it very well. The tea house is situated inside an old Japanese mansion that dates back to the occupation of Taiwan by the Japanese. The inside (built in the 1920s and restored in 2008) is a beautiful mix of paper screens, dark wood, and tatami mats. This is all quite a contrast when you realize that they don’t actually serve Japanese tea! The tea service at Wistaria is traditional Chinese Gong-fu Cha. 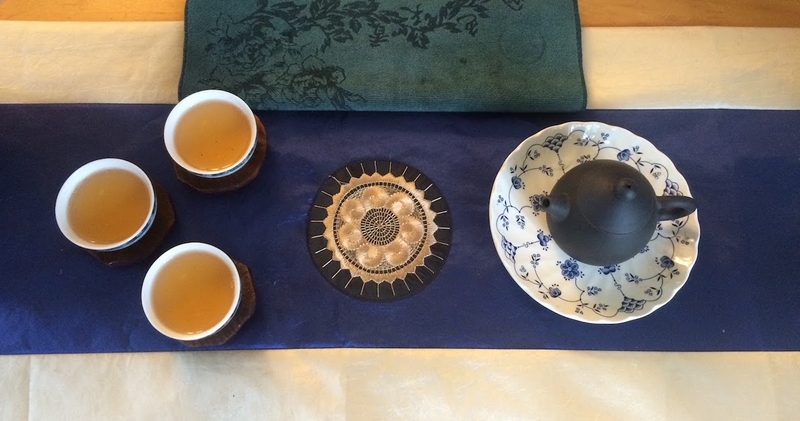 I’ve written about Gongfucha before, but briefly it lies somewhere between a miniature ceremony and a means of preparing the best tea possible. Everything you need is provided: delicate Yixing teapot, scoop, tea pick, cloth, bowl, cups, pitcher, and other accompanying tools. If you don’t know how to prepare the tea, the kind staff is happy to guide you. The tea they serve at Wistaria is, in my experience, top notch. They also serve food, and I remember it being delicious, but the tea so far outshone my other senses that it’s pretty much all I can remember. Metallic Wuyi cliff tea, cloud-like Bao Zhong greens, salty sweet Ali Shan oolong, and earthy Puer are all available for the discerning customer. The first cup had an enchanting aroma. I noticed candied sugar and the scent of sweet syrup. The liquor is golden-green and tastes of jasmine flowers and sweet cream. At the same time there’s a broth like quality to the tea. A bit of salt and vegetables that seems to appear in the mouth. The experience reminds me a lot of the Winter Sprout oolong I found at Song Tea in San Francisco, but maybe a little less intense. The following infusions lost some of the sweetness and the salty broth character became more pronounced. By the fourth and fifth infusion there was only a hint of sweetness like a delicate layer of marzipan as it washed over my tongue. I increased the infusion time to about five minutes at that point and was rewarded with another few delicious cups before I put this tea to bed. It was a delight to be taken back to Taiwan with one cup of tea and returned to my home in the next. This connection is one of my favorite things about the tea experience; it’s quite literally an adventure in every sip. Thanks again to Tammie for this opportunity and thanks to Wistaria for providing such a wonderful leaf. May your cups be filled with adventure too! 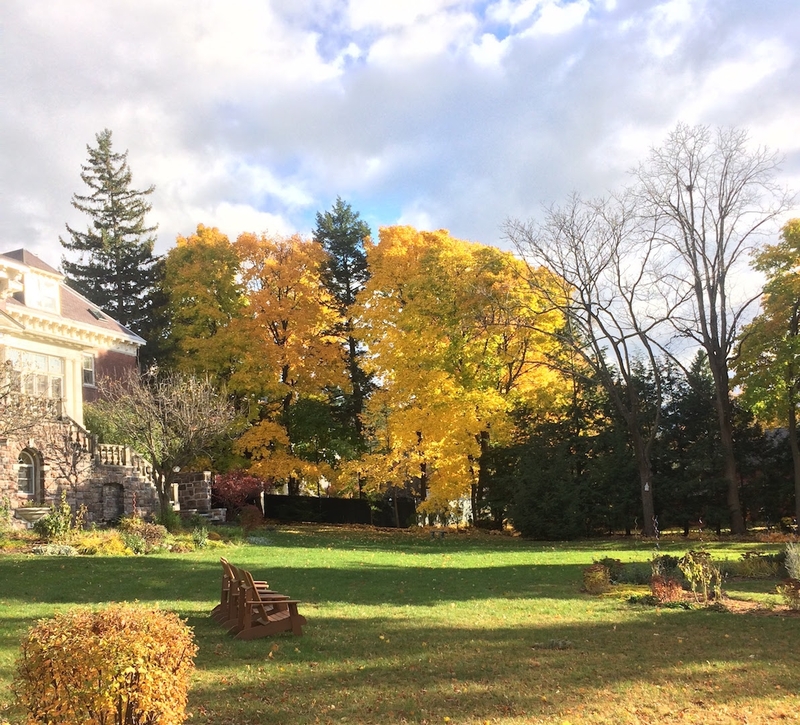 This entry was posted in Tastings on October 20, 2016 by payton. This afternoon my wife found a nice-looking little bag of Puer leaves in our Sheng Puer box. It was labeled (in my handwriting) “2003 Tong Qing Hao”, but had no other information. What was this mystery tea? We decided to drink it to find out! We were originally going to do a rinse, but the rinse (a nearly instant infusion) was so golden and beautiful, we ended up drinking it as the first infusion instead. This proved to be a great idea. As the liquid rested in my mouth, the aroma held a delicate fragrance. It was sweet but not cloying, like the smell of a honeysuckle bush as you walk by on a spring day. The flavor was dry, sweet, and also definitely astringent, but the astringency only served to balance the sweetness rather than take the tea into bitter territory. A perfectly ripe lychee fruit came to mind, or the pith of a sweet orange. There was perhaps the mouth feel of a sour apple with a little bit of the texture of chalk. Altogether a very interesting and delicious tea! One surprise was that even though the flavor was very balanced, this tea still tasted very young for leaves that were 13 years old. Perhaps the leaves were just stored in a dry place or the date was wrong, but it definitely didn’t have any of the earthy characteristics of a mature Puer. This was a good tea to kick-start an otherwise lazy afternoon. Seven infusions later we were awake and ready to get things done. I can always recommend an energizing Sheng Puer for a productive day! This entry was posted in Tastings on August 29, 2016 by payton. 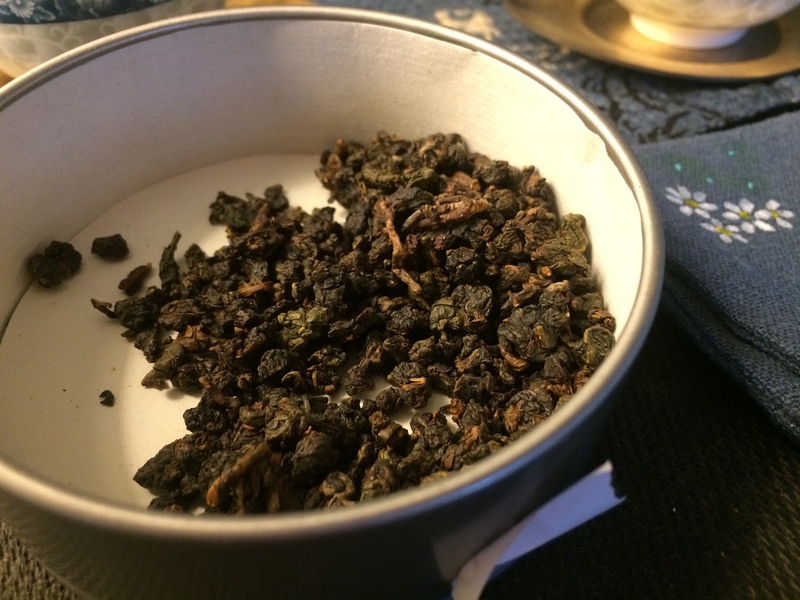 I’d like to share my experiences recently with a 2004 “Ordinary Treasure” Sheng Puer from Global Tea Hut. I had tried this small package of Puer once casually when we got it in the mail, and I enjoyed it immensely. I love a good raw Puer (Shēng chá, 生茶) now and then, but most of my collection is still fairly young. Older raw Puer tends to be expensive, and certainly wasn’t something I expected to receive with my magazine. Fortunately there was enough left in the tin for another try because I wanted to write a little about my experience. Today I brewed the last 7 grams in my Jianshui pot, gongfu style. The liquor had a beautiful golden orange hue, like a sunset over the water. Being fairly loose, this tea does not need any rinse, nor a lengthy first infusion. The sunset appears almost at once. In fact, I had to cut my first infusion with a little extra water because it was a bit too intense. It actually felt elegant as I added the extra water and watched the tea’s deep orange fade to gold. Perhaps that’s where I saw the sunset for the first time. Smooth and mellow, the flavor was comforting and energizing at the same time. While there was a definite sweet taste, it wasn’t the sweetness of fruit. More the earthy sweetness of oats and barley with a little bit of toasted almond. 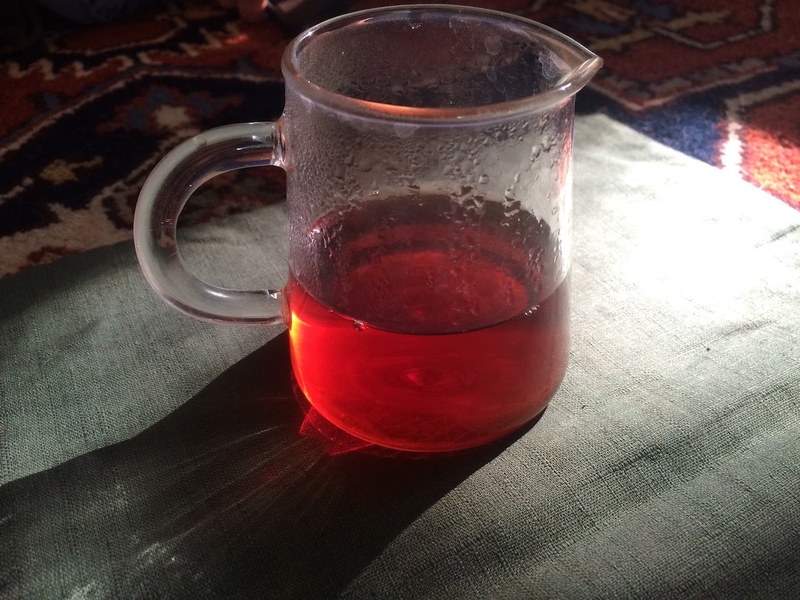 Despite it being only early afternoon, sipping this tea brought to mind the beautiful mountain sunsets of Yunnan; I think I could feel the cool breeze on the evening of a hot summer day. At the third infusion the body became thicker with more of a eucalyptus effect, though still sweet and mellow. How enchanting! I found the heaviness unexpected for a Sheng and yet very welcoming. I wonder if this is the stage between a young Puer’s sharpness and the aged earthiness that I’ve found often arrives when raw Puer gets closer to the 20 year line. The fourth and fifth infusions mysteriously remind me of nothing short of a Hong Cha! So rich and mouth filling with that hint of tannin. Even the liquor’s color belied its processing. The sixth infusion went back to tasting more like Puer with a cedar flavor and a hint of an astringency along my tongue. It was still very drinkable though, and that’s with only about a two minute infusion. Brewing this tea was quite a delight, all the way to the last drop. Many thanks to Global Tea Hut for bringing these leaves to the community. I hope to find more gems like this in the mysterious world of aged tea, and I hope you find some too. This entry was posted in Tastings on August 9, 2016 by payton.